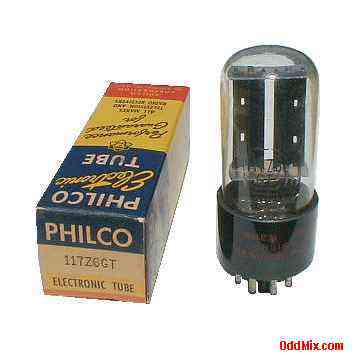 This is a genuine, vintage, dicontinued Philco 117Z6GT Vacuum Rectifier-Doubler electronic tube. This tube typically used as half wave rectifiers as power supply tube for ac/dc radio receivers, instruments and special purpose circuits as a rectifier or voltage doubler. Collectible, useful for restoration projects, a conversation piece or to set up a private vacuum tube museum. It is a NOS tube - New Old Stock, discontinued, unused, boxed, excellent condition.